The Dominican-born designer, who is among the most revered names in haute couture and a favorite of first ladies and film stars, was true to form in the late Tuesday show with twill fringe suits for day and sumptuous evening gowns worthy of any red carpet. He also vamped up the collection with pink silk cocktail shorts and hot pants. “I thought it was beautiful,” said Anna Wintour, the editor of the fashion bible Vogue, after seeing the collection. Other designers showing at New York Fashion Week featured shorts but de la Renta’s, which were paired with silver beaded or ostrich feather embroidered bustiers, are not meant for a day at the beach. “If you have the body to wear it, you can rock it,” said fashion blogger Susan Tabak, adding that she liked the look and the mixture of textures in the designs. Colors varied along with the length of hems, from soft ivory suits and black and navy sleek column gowns to an aquamarine ribbon tweed tiered dress, yellow tops to shocking pink shorts and a Persian lamb skirt suit in the same color. A cherry red silk taffeta, V-neck de la Renta dress that Ann Romney chose to wear for her speech at the Republican National Convention in Tampa, Florida last month won rave reviews and heightened anticipation for his spring collection. If Romney’s husband Mitt defeats Barack Obama in the November presidential election, the veteran award-winning designer will likely be back in favor in the White House. De la Renta, who turned 80 this year, has dressed former first ladies, Republican and Democrat, including Jackie Kennedy, Betty Ford, Nancy Reagan, Laura Bush and Hillary Clinton, who wore a plum-colored de la Renta gown to her daughter’s wedding. A notable exception is Michelle Obama, who has been criticized by de la Renta for some of her fashion choices, including wearing a sweater to Buckingham Palace. 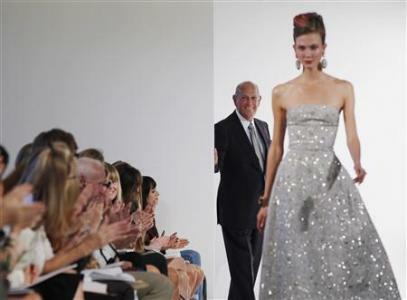 De la Renta recently won The Fashion Institute of Technology 2012 Couture Council Award for Artistry and took aim at celebrity fashion designers — sports stars and actresses who are delving into fashion — for their lack of formal training. “I’ve been at it for 45 years, and I’m still learning my craft on a daily basis,” he said after winning the award. His years of experience and mastery of his craft were on display in the details, cuts and choice of fabrics in the 60 designs displayed in his newest collection, particularly in an eye-catching black and ivory striped duchess satin gown with a draped bow. The Mercedes-Benz Fashion Week features hundreds of shows staged at Lincoln Center and other venues around New York, and it is followed by fashion weeks in London, Paris and Milan. The semi-annual event attracts 116,000 people to New York City, from buyers to foreign press and wealthy customers.